A breeze on Saturday pushed a huge wildfire back toward the Okefenokee Swamp and away from U.S. 1, but the highway remained closed and homeowners were warned they might have to evacuate again. The blaze in southeastern Georgia had charred nearly 100 square miles — or just under 66,000 acres — of forest and swampland since it stated April 16. 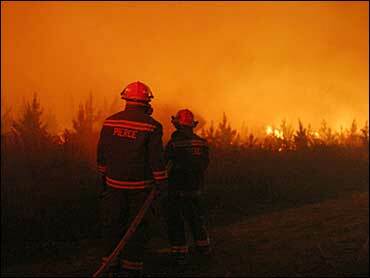 Authorities said the 150 firefighters had managed to get about half of the blaze under control. Firefighters conducted controlled burns along a 16-mile stretch of U.S. 1, which links Waycross with Jacksonville, Fla., to remove fuel and prevent the main fire from crossing the road. Wind, low humidity and bone-dry vegetation combined to keep pressure on firefighters. "We are still in the throes of a very, very difficult effort and we anticipate this fire burning intensely for at least another week — and maybe another month," said Buzz Weiss, spokesman for the Georgia Emergency Management Agency. The highway remained closed, and residents of nearby communities who had been allowed back to their homes were told to be ready to evacuate again if the wind shifts, said Georgia Forestry Commission spokesman Eric Mosley. However, Saturday's wind pattern was carrying smoke away from the towns and back into the swamp, Mosley said. "I'm ready for it to be over," Jamey Cribbs, 21, said Friday. He said he stayed up all night with his father to make sure no burning ash from the fire fell on their home at the edge of the Okefenokee Swamp. "It's only been two weeks, but that seems like a lifetime." Cribbs' family had been ordered twice this past week to flee their home in the tiny Braganza community three miles southeast of Waycross.